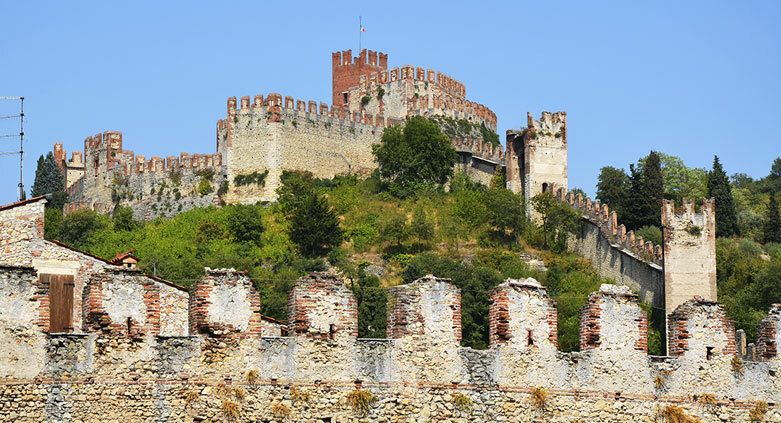 Soave is a charming ancient town, but also world famous for its classic white wines: the Soave Classico DOC (Controlled Designation of Origin) and the Recioto di Soave. 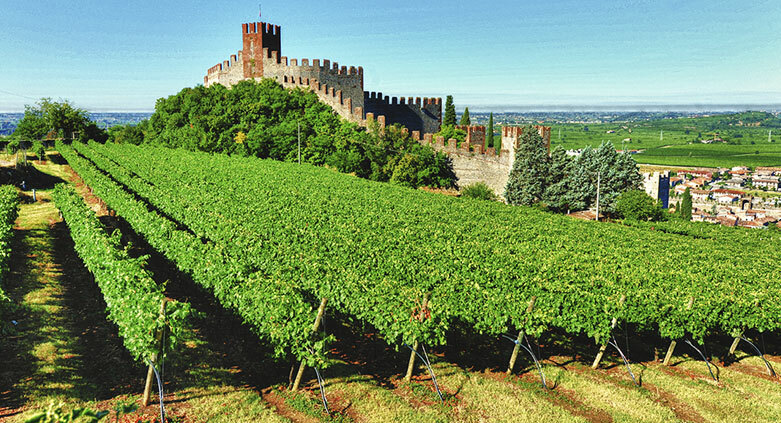 Visiting Soave is an unforgettable experience: a trip into history, but also a trip to learn about the fruity-floral fragrances of this pleasant wine. When you enter the 14th century walls or if you walk along the ancient communication walkways in the castle, you will imagine yourself in the past, when knights walked around wearing heavy armour and elegant ladies lived in ancient Suavia. The German tribe called Suaves arrived here in the 6th century and their name later evolved to become the modern Soave (which also means sweet and gentle in Italian) and when you finally reach the top of the castle keep (the mastio) you will discover one of the most incredible views spanning from Mount Baldo in the west to the Lessini Mountains in the north all the way to the Po Valley in the south. Starting by coach from Porta Verona, the ancient fortified gate and main access to the town, we will drive up to the castle, at the top of Mount Tenda. The road runs along the Tramigna river, which owes its name to the fact that it flows ouside the walls, “extra moenia” and it used to be the moat surrounding Soave. Traces of ancient drawbridges can still be seen on the main gates. As we drive up to the castle you will see the walls with 24 towers and they encircle the town in a sort of embrace: a fantastic view. These walls were built in 1369 by Cansignorio Della Scala, lord of Verona, to protect Soave, until then without protection. The moment we reach the castle you’ll immediately see the mighty tower, with a sculpture of Saint George over the drawbridge. Entering the first courtyard, surrounded by the impressive walls with their walkways and battlements, you will also see the ruins of an ancient church, probably a spiritual and physical shelter for the ancient inhabitants of Soave. Crossing the portcullis we enter the second courtyard, the largest one, where traces of the former existence of barracks for the soldiers show it used to be the parade ground. The entry gate carries, on its walls, a fresco called “Madonna della Misericordia” dating back to 1321. The third courtyard is also the last one. Here rises the mighty “mastio”, the keep, the most strenuous defensive barrier, but also a place of imprisonment and torture. Not far from the keep the Captain’s House is visible, an ancient medieval house, with a guard house on the ground floor: a bare room with defensive weaponry on the walls and suits of armour. The external staircase climbs up to the central room called “La Caminata”, because of the large fireplace it contains. On the walls one can admire frescoes showing the ladder, the coat of arms of the illustrious period of the Della Scala family. In the other rooms you will find antique furniture, precious frescos and valuable chandeliers in wrought iron hanging from coffered ceilings. The atmosphere of ancient times, when lords slept in canopy beds and elegant banquets were held in the dining room is easy to recapture. From the last room, decorated with an ancient chain mail, we climb to the top of the keep. Here the view is fantastic: one sees Mount Baldo, the Lessini Mountains, the sloping hills and the medieval town. From the castle we walk back to town, following a cobblestone road and reach Piazza Antenna, dominated by a high flagpole: for many centuries the Venetian banner was fastened to it, showing that Soave was under the rule of Venice. In this square a number of notable palaces were built: Palazzo di Giustizia (Hall of Justice) erected in 1375 as mentioned in gothic writing on a stone inscription, or Palazzo Cavalli built in Venetian-gothic style and once covered with frescos by Giovanni Maria Falconetto, or Palazzo Pullici where the poet Ippolito Pindemonte lived during his infancy and is now a award-winning winery. Our visit continues: we will have a look at the churches of Soave, starting from the 18th century Parish Church, dedicated to Saint Lawrence. Inside the church the ceiling is partially painted by the local artist Adolfo Mattielli, while near the main altar there is a valuable altarpiece by Francesco Morone from Verona. Another church of outstanding interest is the Church of the Dominican Fathers, built in the 15th century. If open we will be able to look inside and see the precious frescoes depicting the story of San Lazzaro. We exit Soave from the northern gate, Porta Bassano, and reach other churches such as San Rocco, built in 15th century and restored in 19th century or the church of Santa Maria della Bassanella, built in the year 1000 on a low hill surrounded by vineyards. It was later rebuilt in Neoclassical style in the 19th century. Inside the church there are fine frescoes, paintings by Adolfo Mattielli and the miraculous statue of the Virgin and Child, who saved the people of Soave from the plague. Outside the city walls, in nearby Borgo Covergnino, the Church of Saint George, a fine example of 12th century art, was built by Franciscan Friars and traces of original frescoes are visible, while a whale’s rib curiously hangs from the ceiling. And now, at the end of the tour, we can’t miss tasting a glass of Soave or Recioto, both famous all over the world. 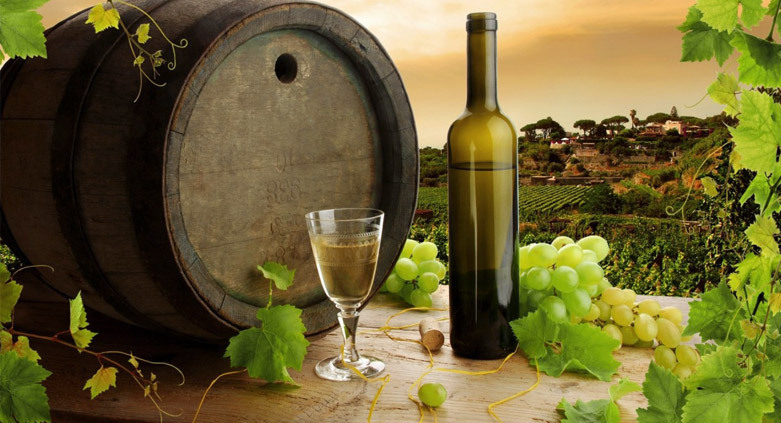 The existence of a similar wine is testified already in the 6th century by Cassiodoro, King Theodoric’s learned minister, who praised it as “a golden milky drink”. And when the German population, named Suaves by the Romans, arrived here with the Lombards, they decided to stay, giving their name to the town and to its wines. The same way they were fascinated by these charming hills, you also will be fascinated by this land, so ancient and magic and so “gentle” (soave in Italian). MEANS OF TRANSPORTATION: the bus or car of the clients is necessary for this tour (departure point to be decided with your guide). The first part of the tour is by bus, after about 30 minutes we stop to visit the castle. A walk of about 10 minutes will later bring us to the town centre. After this we drive to a wine cellar for the wine tasting. Entrance to the Castle and wine tasting. AVAILABLE LANGUAGES: Italian, English, German, French, Spanish, Portuguese, Finnish and Japanese. Ask for the language you are interested in. TO COMPLETE YOUR DAY: the Abbey of Saint Peter of Villanova and the small geo-paleontological museum (reservation necessary). FOR WHOEVER HAS AN EXTRA DAY: Verona, Lake Garda, the Rice Road tour, Valpolicella.